At this past Sunday’s Beach Baptism, 41 people took the step of baptism. That is a huge deal, y’all. Luke 15:10 says that there is rejoicing in the presence of angels of God when one person changes their heart and life, can you even imagine what 41 must be like? Baptisms are an event with lots of details and logistics and, like all good event planners, we plan for everything and even have a rain plan in our back pocket. Luckily, if you were there or just happened to step outside on Sunday, you know that the weather was unreal. The day ran smoothly. But Beach Baptisms are way more than an event for me. When I am there and people start arriving, something in me switches. Because I’m not just checking in people to get baptized and giving them details for the day, I am getting to personally celebrate with those taking that next step. And I’m not just prepping hot dogs (so many hot dogs), I’m getting the opportunity to serve my Summit family. I love the way God has used Summit—our Sunday worship services, Connect groups, reGROUP, and volunteering to bring his people closer to him. I love that we head out to the beach (a place I feel God’s presence deeply) to have a worship service and that pretty much every time there’s a flock of seagulls that fly over as we are worshiping. But mostly I love getting to witness each person answering those three questions before they are submerged into the water. It reminds me of my baptism so many years ago, the answers I gave, and the feeling of renewal in God. Baptisms are an opportunity to celebrate what God is doing in individual lives, an opportunity to cheer like crazy, and remember our God is big and changes people from the inside out. So thank you to all those who came out to cheer and celebrate and congratulations if you were one of the 41 people that took the bold step of baptism! Jessica Meyer is the Executive Assistant at Summit Church, which basically means she can answer any question you have! 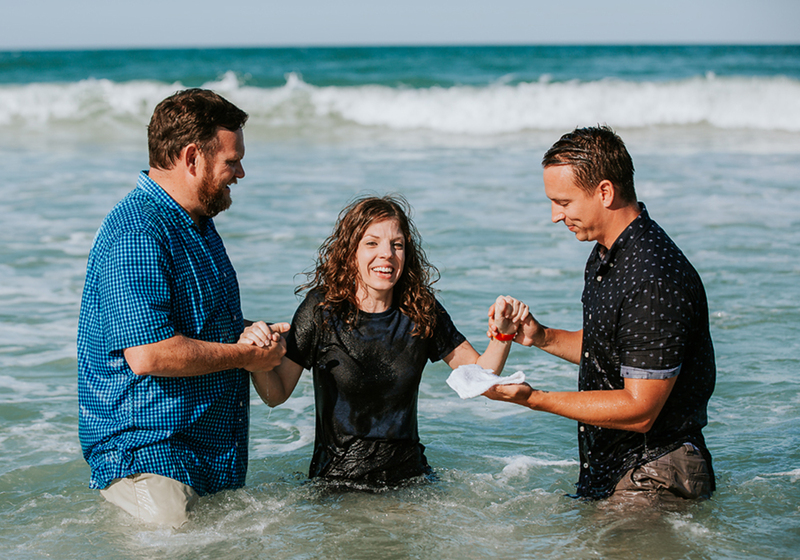 Send her over an email at jmeyer@summitconnect.org and be sure to thank her for all the work she puts into making Beach Baptism happen! We'll have more pictures from the day on our Flickr page by end of day this Thursday. Be sure to check back!